I'll be the moderator and as I'll know what letters everyone is holding, I can't play . But that's okay . You'll be PM'ed your letters when we start and after your turns are taken. 4 players needed. You will have 24 hrs to take your turn, so please be prompt. Missing 2 turns will result in your expulsion. I have a blank board that I will put your words on and have posted in the second post. Your scores will be there as well. You will have to be sure to tell me where to place the word you want on the board. I'll be using: http://www.hasbro.com/games/adult-games ... /wordlists or the word search @ the http://www.hasbro.com scrabble section. If your word is legit, it should be in there. 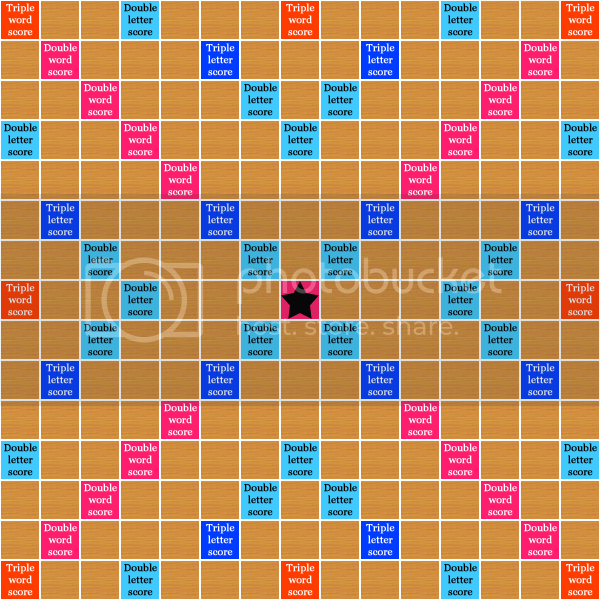 This is in the case that a word is challenged by another player. If it's not challenged it'll get placed on the board. Last edited by poptartpsycho18 on Sun Apr 12, 2009 7:27 pm, edited 136 times in total. Last edited by poptartpsycho18 on Sun Apr 12, 2009 7:29 pm, edited 136 times in total. Plus, the board you put above. Will it be done like a graph or do we just say "letters go through there to there" or something? What are the rules to Scabble? Skittles! wrote: I would like to join. You'd tell me where to place and I'll update the board w/ the new addition and put the edited picture up. So for example if you want to put "FISH" on the board, just tell me what other word it'd be attached to and how and I'd edit the picture as needed. Last edited by poptartpsycho18 on Tue Oct 28, 2008 5:29 am, edited 1 time in total. Blah yeti--you know what i mean . I forgot the R, I know. Okay, we have 4 players, so lets get started. Letters will be sent shortly. Remember that you must wait for the board to show the player who went before you's word. But if you're sure of the positioning you can submit your word. Last edited by poptartpsycho18 on Wed Oct 29, 2008 6:07 am, edited 2 times in total. axe, one line below buc_et, with the e under the b. Okay, updated. Going to bed now and work later, so the board won't be updated until later this evening. don't you get double points when you go 1st? drake_259 wrote: don't you get double points when you go 1st? I'm going to bed soon, so I'll just do my thing now. WRITE, with the E of the "SENT" being the last letter. Skittles! wrote: Damn you Cena! Sorry for doing this earlier than you updating the board, but..
CHANT - with the H of "China".